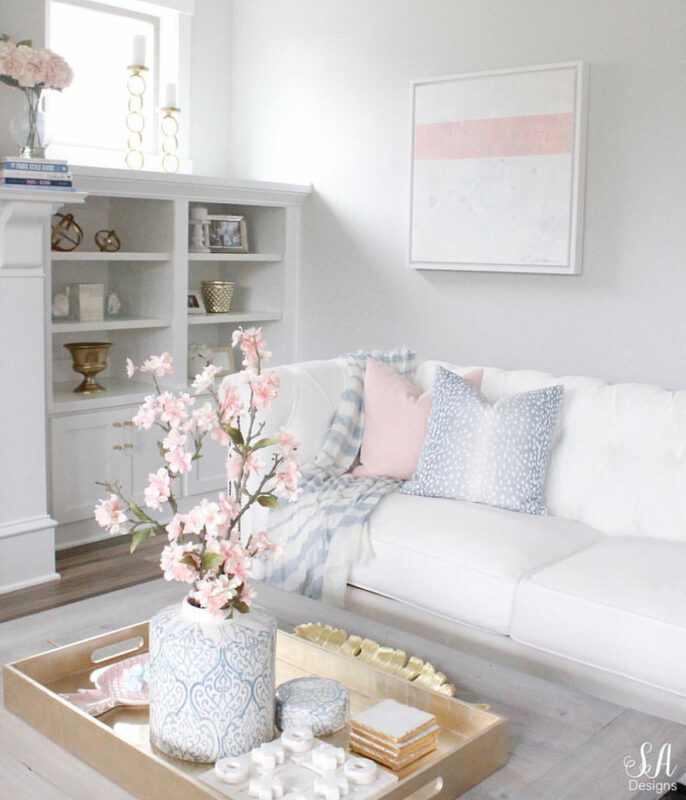 I’m so excited to share an update to our living room with all of you today! 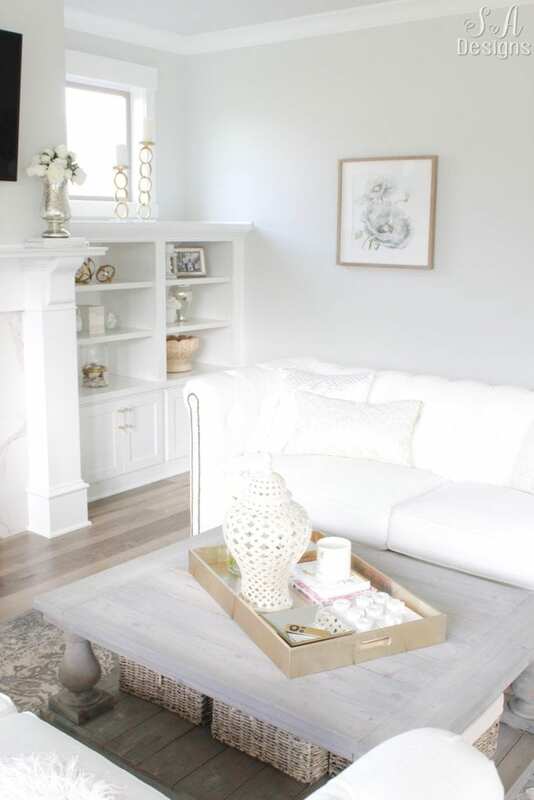 When I first revealed our bright white living room after moving in last fall, I had rushed to find temporary lighting, a rug and some art for the walls. 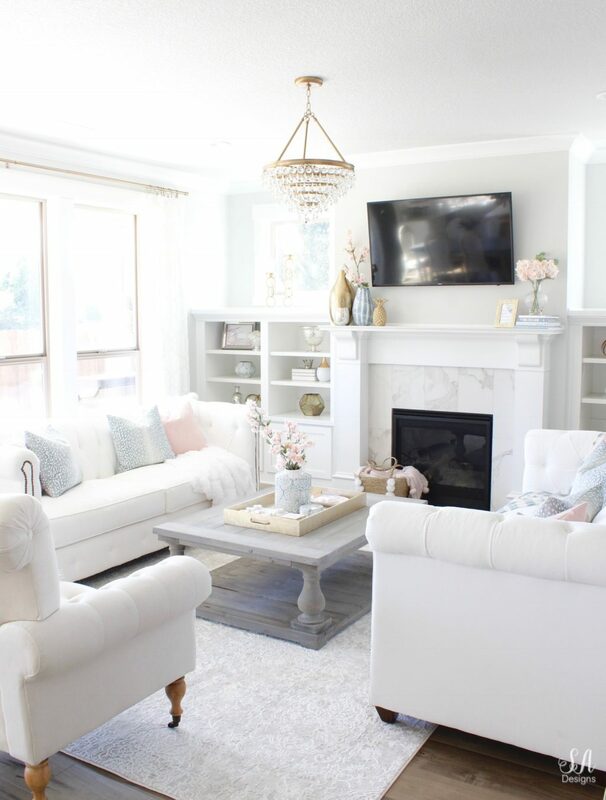 It looked lovely but not exactly what I wanted or envisioned for that room. 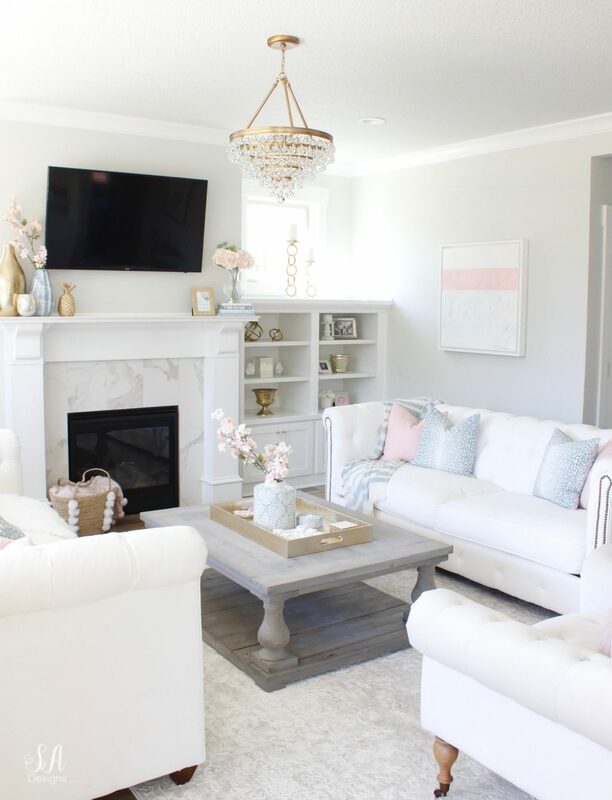 Although I recently shared some fun touched to this room in my summer tour, we finally found the perfect chandelier and rug that I’d been wanting for this living room and also a fabulous new piece of art that has really brought it all together perfectly! 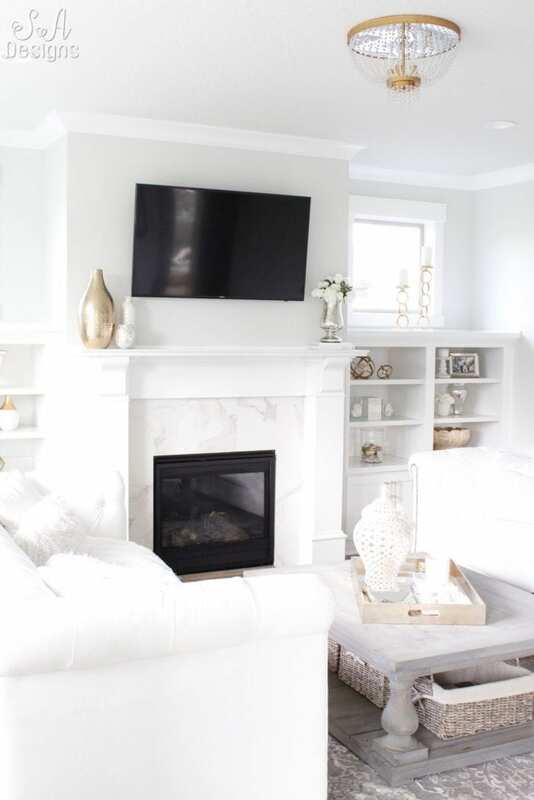 I had most of our lighting chosen for the new house last fall as we were finishing the build of our home but I was panicking, as I really didn’t know yet what I wanted for this living room. I mean, I knew what I was envisioning but not finding it exactly. 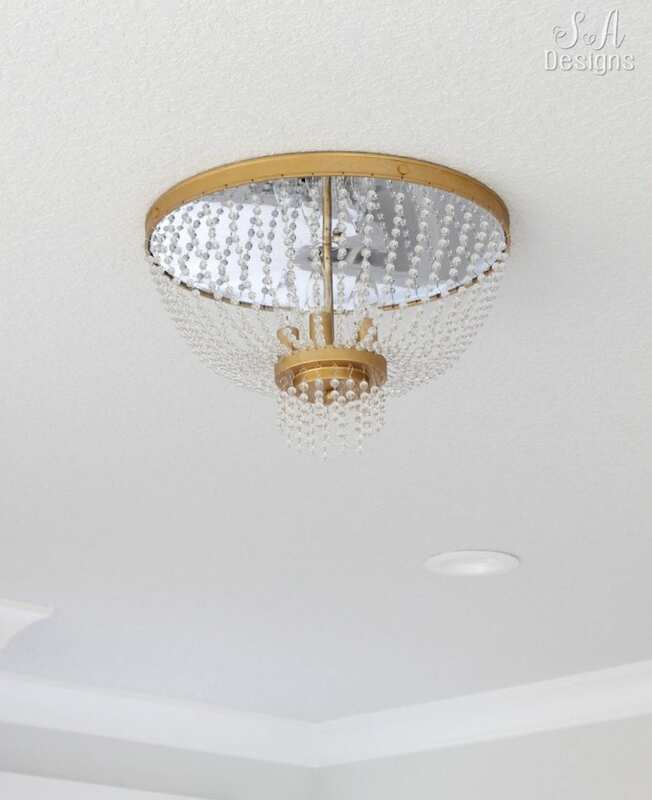 I found this flush-mount lighting and since it had brass and some clear beaded strands for a reasonable price, I bought it to hold me over. Our superintendent was needing our living room lighting ASAP. Do you hear angels singing? Because I sure do! 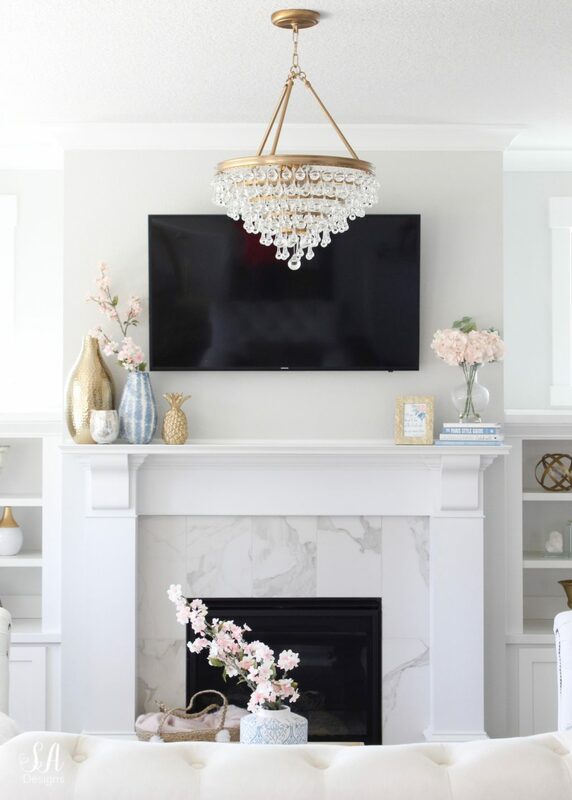 This Crystorama Calypso 136-VG 6-Light Chandelier has the most beautiful crystal drops with a vibrant gold finish and it’s the perfect size for this living room! 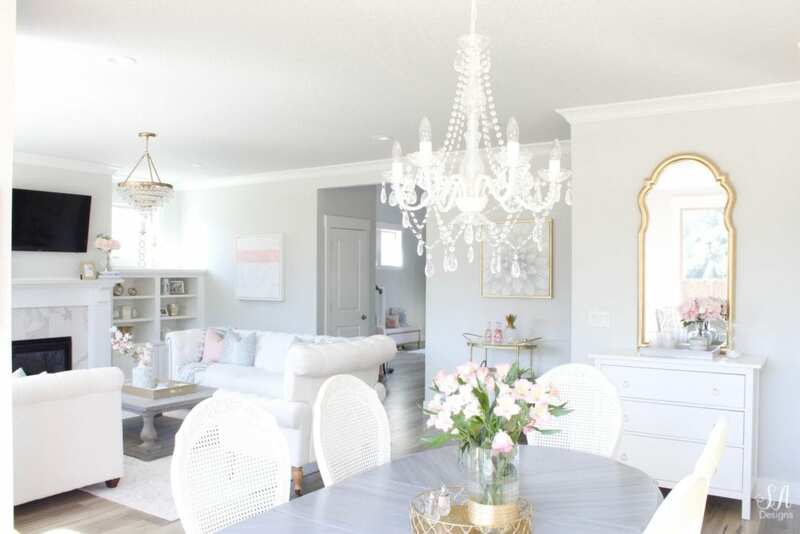 I have always said that your chandelier is like the jewelry to your room and I wasn’t happy with my lighting before, but NOW….it finishes this room perfectly! I’m so thrilled! I love how breathtaking it is, as you walk into the living room from the entry of our home. It definitely makes a statement and a great first impression! My friends at Crystorama were gracious enough to partner up with me on this update to my living room and I was so thrilled because they had also collaborated with me on my Master Bathroom lighting and y’all KNOW how obsessed I’ve been with that lighting! So many of you have gone crazy over it too! Crystorama has the prettiest lighting solutions! I’m so in-love with this one I chose! The rug I previously had in our living room was beautiful. There was nothing wrong with it at all. It was actually good to get us through the winter months and wet feet. But I felt it was too dark for this room. You might disagree but last year I was in a store and found the perfect rug. I even shared it on my Instagram stories and you all went NUTS over it and hoped I’d bought it. But sadly….after I shared it with you, a man moved me aside to grab the rug for a customer who had asked for it. Sad! But I was able to find the rug I’d been dreaming of since that day. 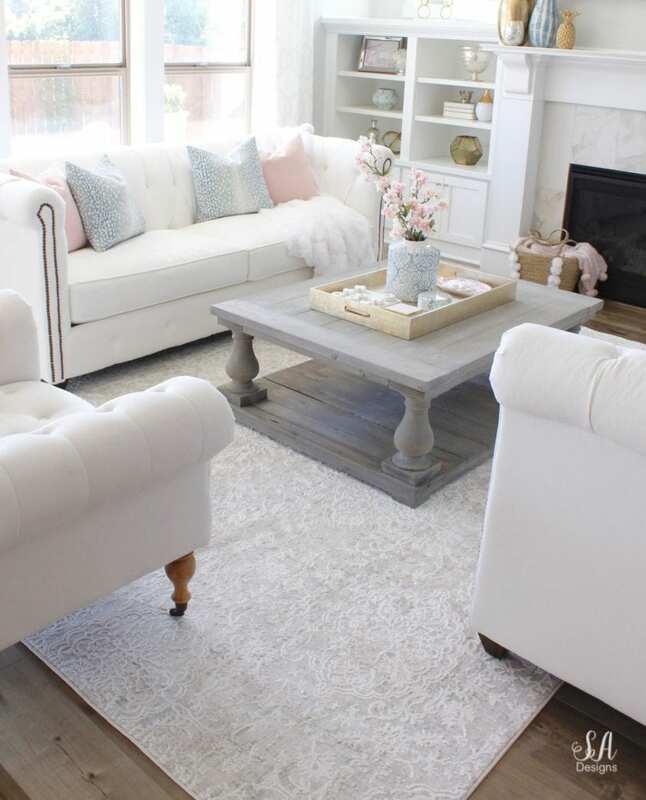 I partnered up with RugSavings.com and they had this rug I loved so much, the Dynamic Rugs Quartz 27030 Area Rug in Ivory/Beige. 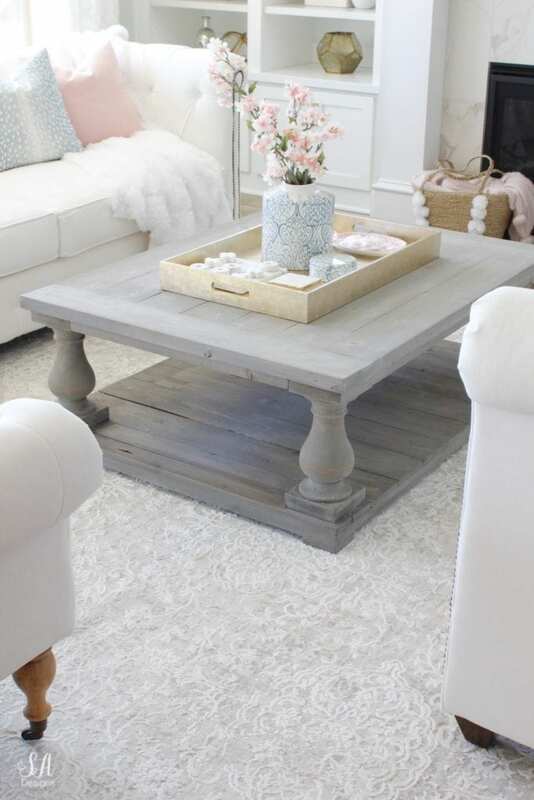 It has the prettiest mix of cool ivory, beige and gray and goes so much better with this room. It really brightens it up. I also took the baskets out that were underneath the table. It trapped the light from passing through and I felt like it made this entire coffee table look too dark and heavy. But with a new rug and removing the baskets….the change was huge and now I love this space so much more! Even Giorgio loves it! It’s just so pretty and I’m thrilled with the difference it’s made in this room. 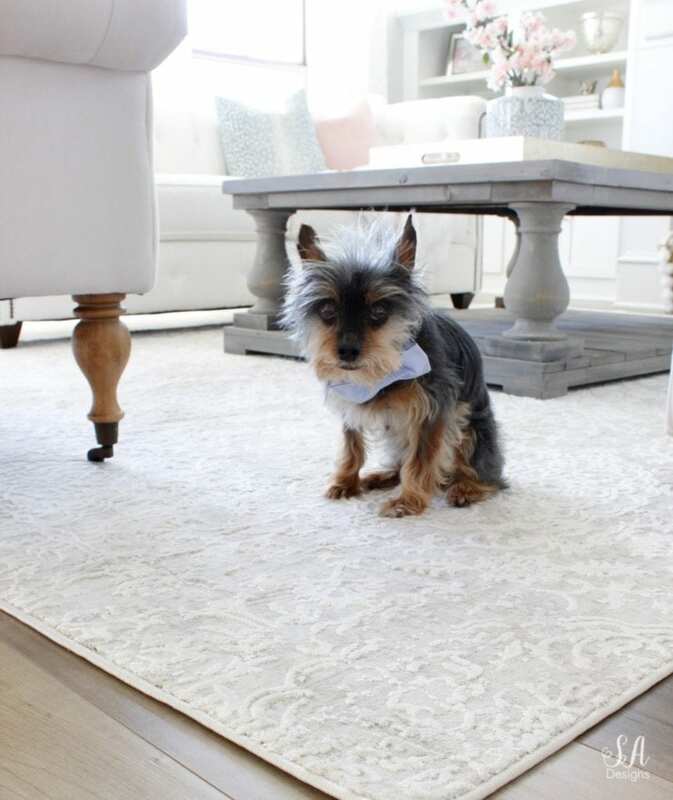 If you place an order with RugSavings.com on this same rug of mine or even a different rug, they’ll give you 5% off using the code: “SADAMS5OFF“. 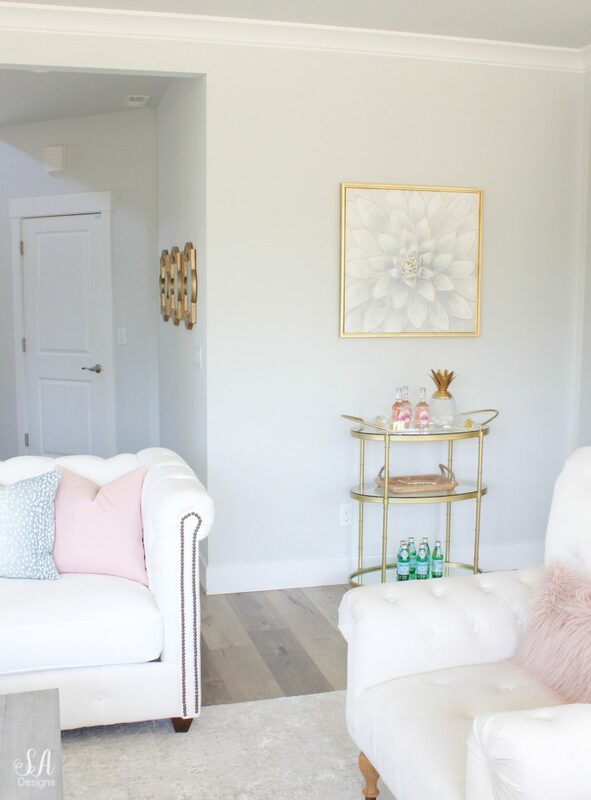 When I first styled the room last fall, I couldn’t find a piece of art I was really loving specifically for this space. I just used what I had from our last home that hadn’t been hung yet. It was fine. But then I met Craig Wellbrock, an artist here in the Pacific Northwest, and he sent me this piece. 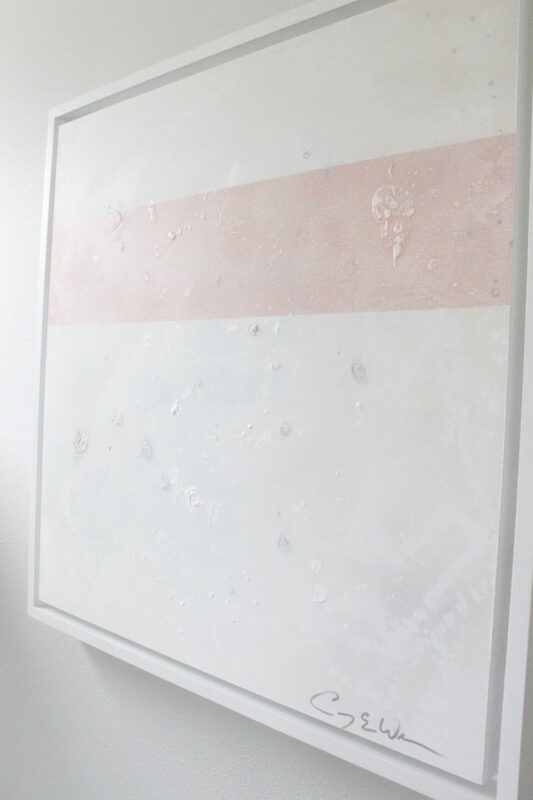 I wanted one of his minimal abstract art pieces and then he went a step further to make it even more “me” and added this blush pink stripe. You can see more of Craig’s art HERE and contact him for interest in his pieces or to have him create a commissioned piece for your home. 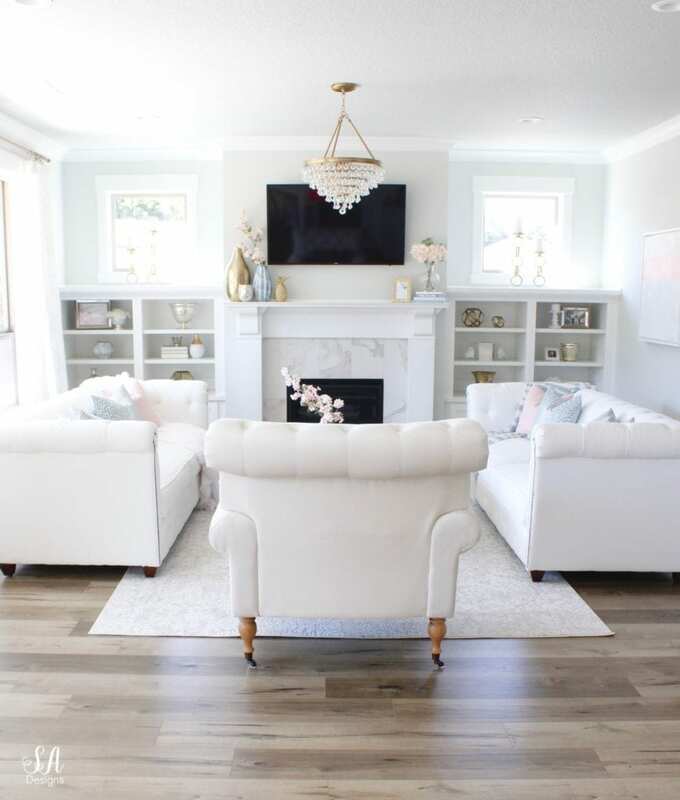 I’m so pleased with how just a few small changes made such a HUGE impact on this room and gave it a whole new look! 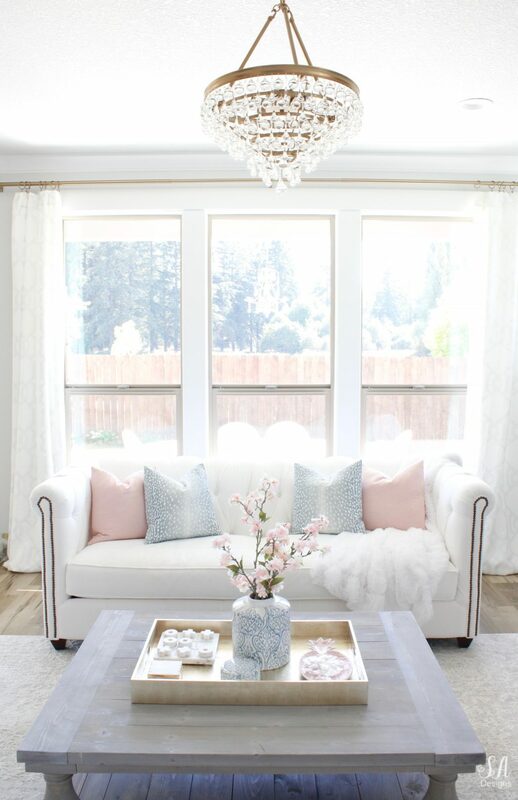 The new chandelier and rug, along with removing those baskets under the coffee table and allowing light to pass through more freely, have all helped brighten this room and reflects more of my style and the feeling I wanted here in our living room. In a place like here, in the Pacific Northwest that has lots of cloudy and rainy days, keeping my home bright and happy is so important. I survived our first winter last year just fine! Every time I’m home, no matter what the weather outside, it is bright inside and such a happy and beautiful place to be. That’s really important to me. I love being at home and having people over and entertaining. Art above from HomeGoods. Bar Cart found HERE. 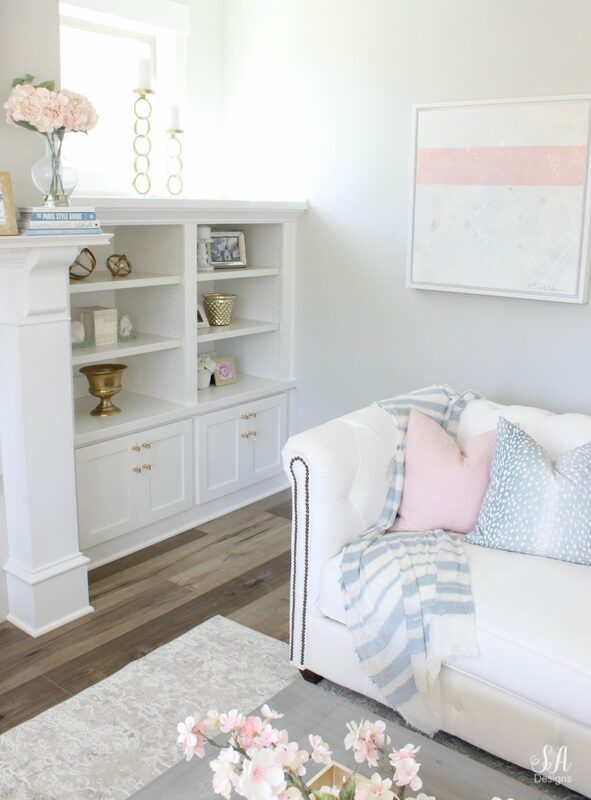 You can see more of my Living Room details and sources for furniture and decor in the original reveal post AND in my Summer Tour post when I brought in some pink and blue. You can click HERE to find more info on my paint and flooring. They are popular pages. It was beautiful before! Now it is stunning! Love all you do to your home!!! Those small improvements made a huge difference. 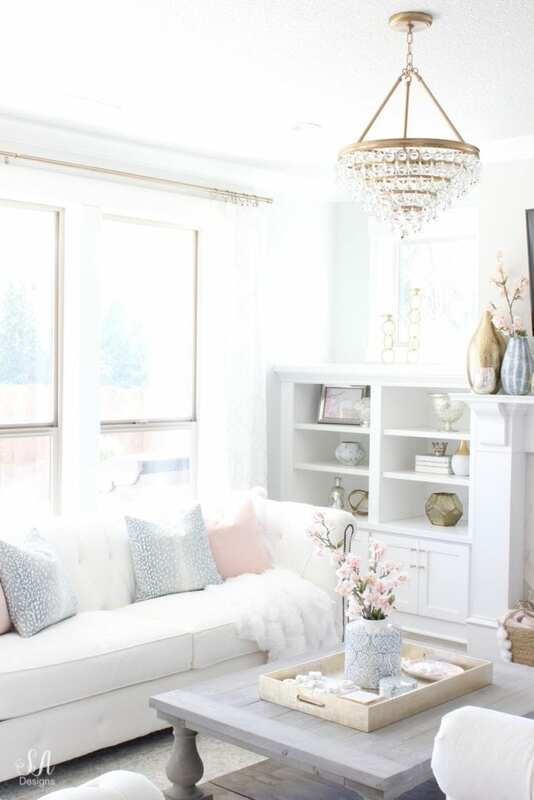 The chandelier suits your room much better than the flush mount and the lighter carpet is perfect. I love your sofas! 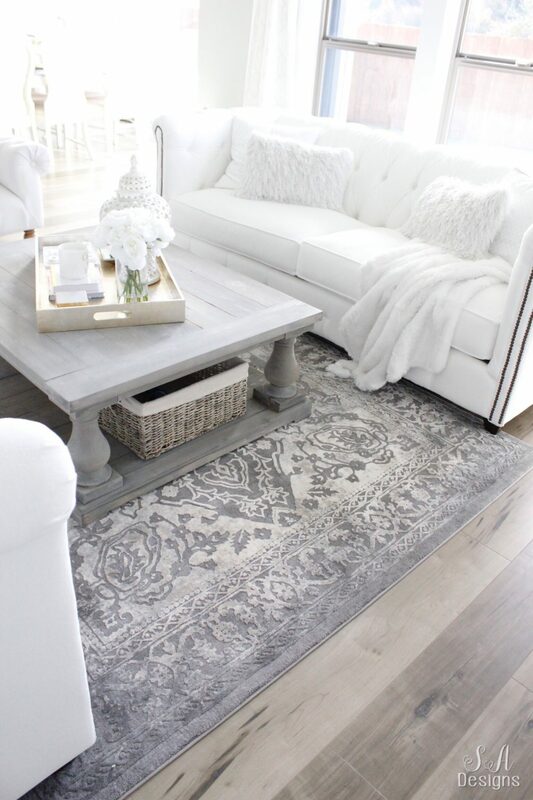 The rug looks more grey than beige on the site whereas it looks more beige in your living room. Which is reality? Joanna, thank you! It’s crazy how much one thing can change a room. That chandelier is soooo much better! I’m so thrilled with it and glad you agree! As for the rug, it’s what I would probably call “greige”, the perfect grey-beige. But I’ll tell you that I don’t edit the color at all on my photos, if that helps. I love the room. Beautiful and bright. 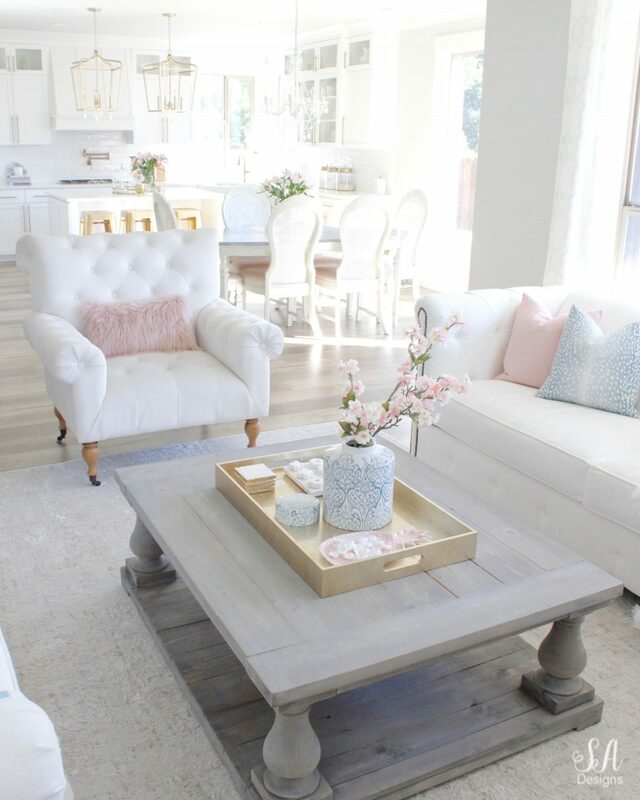 Where is the coffee table from? OH MY GOSH! Utterly beautiful! I love it all. I have to say my favorite is the table! You have a real knack for this. I sure do not so I hope you don’t mind if I copy some of your decorating talents!